The intricate, laser-cut design of this votive holder is adapted from the patterned art glass used for the entry sidelights in the George Blossom House (Chicago, Illinois, 1892). 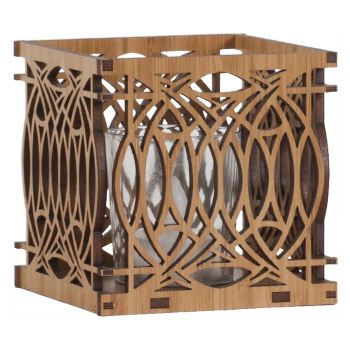 Made of sustainable Bamboo, includes a glass votive holder and a flicker LED battery operated tea light. 3-3/4" square.